A littler shorter than usual post today. I am in LA, and well, trying to keep up with my younger brother Kai, his friend and my cousin Abby is almost beyond my reach. FYI, the whole LA cloudy skies and 60 degree weather thing is SO not cool. Come on, I have been dreaming about the warm sun and 80 degree temps that southern Cali is known for? I am telling you, I bring the clouds and cold temps with me. UGH. Oh, well, I guess it’s better than snow. My mom said it snowed the entire weekend back at home! The good news is that I think I have got my brother excited about going to school in LA, which clearly I am excited about because that means visits!! Yes! Hopefully the weather will include sunny skies for the next visit though. So on Friday we visited FIDM, the Fashion Institute of Design and Merchandising. Not exactly a school that my brother would be first to consider, but the school has grown way beyond simply fashion and design. I love the internships they offer and their progressive ways of teaching. I think I have mentioned before that my brother Kai (Malachi) is a snowboard filmer, but he would like to get a business degree. If he were to attend FIDM, he could combine both of these interests by getting an AA in Digital Media and a Bachelors of Science in Business. It also doesn’t hurt that 90% of the student population are women. My excitement and knowledge on FIDM comes from personal experience. Before I started this blog I was all set to start at FIDM. Knowing the type of person that I am, I headed out to LA as soon as I graduated from Colorado Mountain College, got an apartment and a job and began living the LA life to make sure it was for me, before committing to two more years of school there. The job worked out well, and I had a nice little apartment, but after a few months of living in LA I didn’t feel ready to commit. Looking back I think it was just too much different too soon. But I am super excited that this may be where Kai soon calls home. 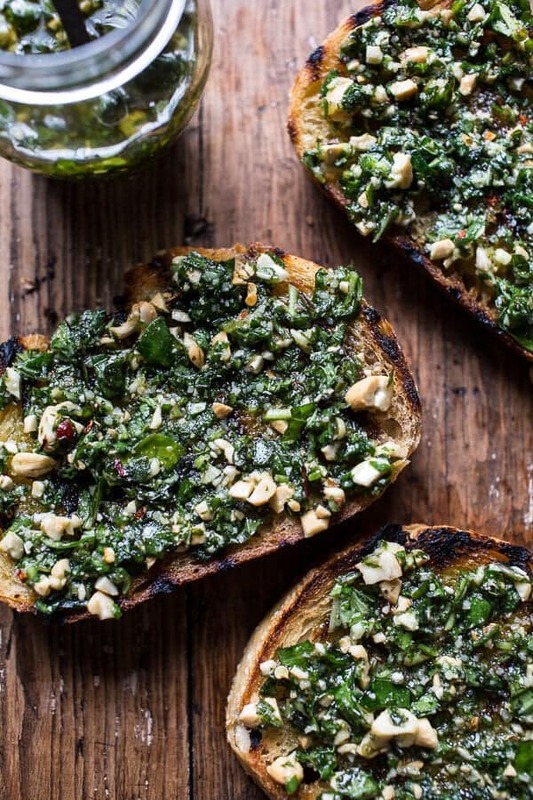 I really want to tell you about this pretty as ever arugula-basil pesto bruschetta. 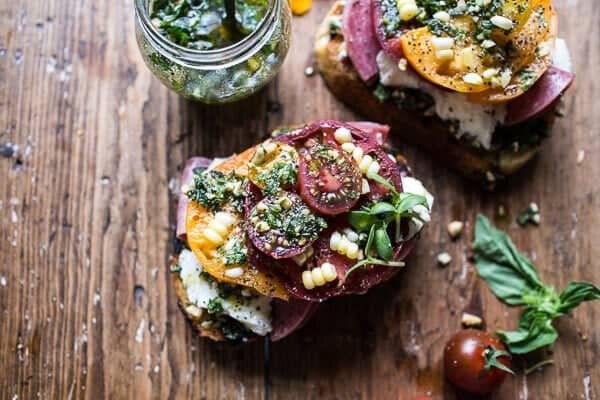 This bruschetta is so prefect for summertime entertaining. 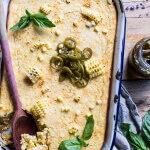 It’s a great use of farmer’s ingredients and so fresh, easy and delicious. 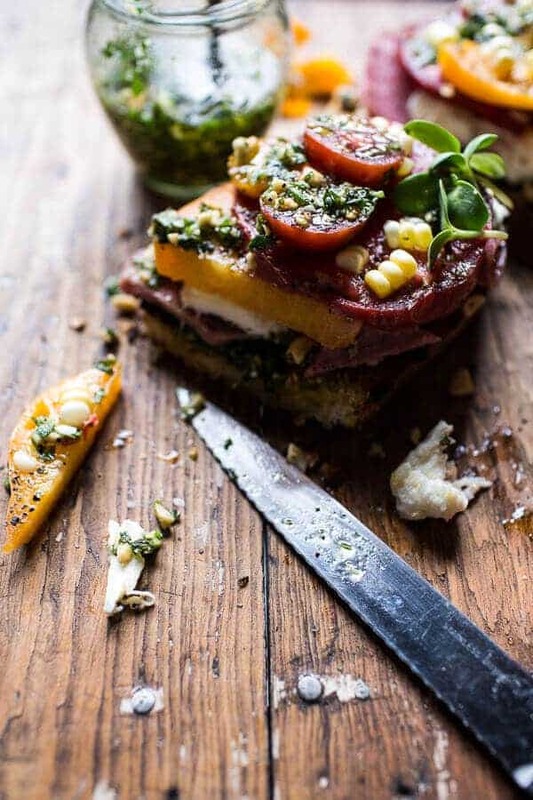 Plus, umm that arugula pesto with those perfectly sweet tomatoes – perfection. If I could add in an emoji with two thumbs up, this would be the place. For the pesto, I kept everything really simple by just leaving it a chunky pesto. This way all you need to do is chop and add everything a to a bowl. I don’t know about you guys, but to me, breaking out the food processor or blender just to make some pesto is a pretty daunting task. I honestly despise cleaning my food processor. Just way too many parts. I love the mix of spicy arugula and basil. Plus, I used cashews in the pesto in place of traditional pine nuts for a little change-up. Some salami, which you can of course leave off if you are a vegetarian, but I personally love the flavor it adds. Especially with the combo of the pesto and tomatoes. I also added some buffalo mozzarella for a little bit of cheesyness, because you know I cannot make a meal/snack/appetizer or whatever you want to call these without a little cheese. Cheese makes all things better but especially carby things. Oh, and I sprinkled in just a few kernels of fresh corn. Clearly, it is early for corn, but surprisingly, my grocery store has had it in for a few weeks now and it’s actually pretty good, so why not go for it. With Memorial Day being this weekend, I figure today was a pretty good time to share this quick app with you guys. It’s definitely going to be a staple me for me this summer. 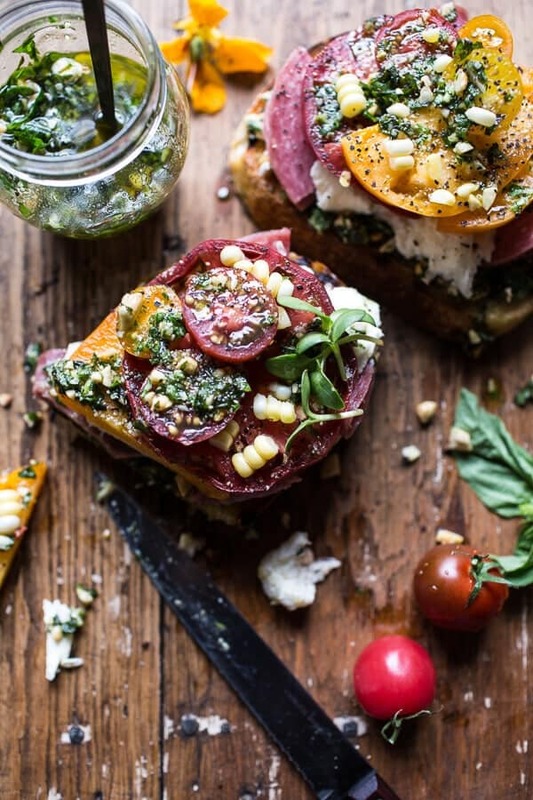 This bruschetta is so prefect for summertime entertaining. 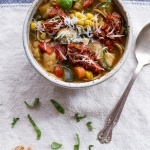 It's a great use of farmer's ingredients and so fresh, easy and delicious. Preheat your grill to high heat or preheat your oven to 450 degrees F. Place the slices of bread of bread on a baking sheet and drizzle with olive oil on both sides. Rub each side of bread with the halved garlic clove. Sprinkle the toast with salt and pepper. Place the bread slices on the grill and grill both for about 2-3 minutes per side or until lightly chard. Remove from the grill. 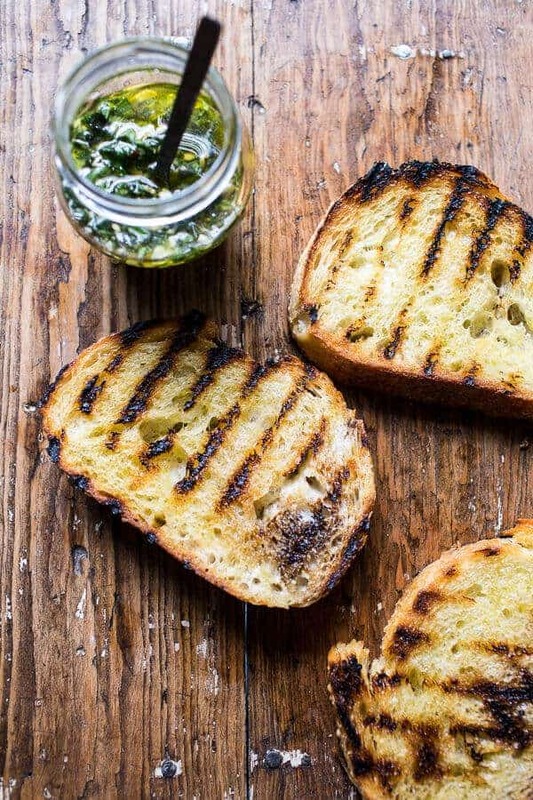 Spread the bread with pesto. Add a slice or two of salami and then add some of the torn mozzarella. 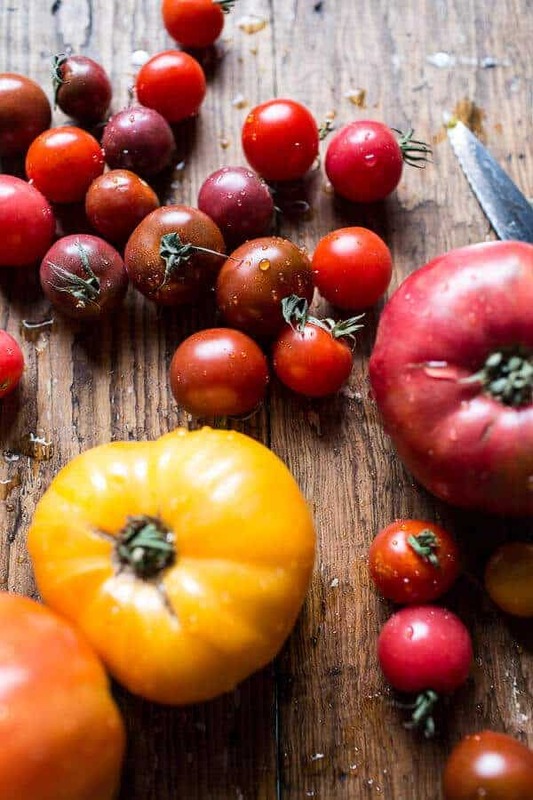 Add a few slices of tomato, sprinkle with salt + pepper. Top with a little pesto and a little corn. But can we all agree this is some seriously good Monday food? I think so. This looks delicious…I love salami…I can’t help to think that this would make a pretty awesome pizza too. Tomatoes are not in season here yet (SE Washington) even though we have no snow, but arugula is! Arugula walnut pesto is the first pesto I ever made after a trip to Portland, Ore., 15 years ago (back then you had to special order arugula from the grocer) when we packed it into portobello mushrooms and broiled them topped with parm; it’s my favorite because it isn’t overpowering like total basil! I like your idea of keeping it chunky, but I’m klutzy when it comes to chopping so I use the processor and just throw the parts into the dishwasher and never look back! 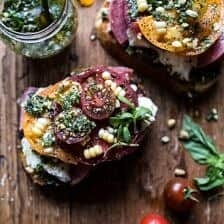 When tomatoes come on in July and August, we will bring out the bruschetta , and salami from the great charcuterie shop we have here, http://www.salumierecesario.com/ (Come visit Walla Walla!) . While you’re in LA, check out the Getty Museum. My daughter was just there (with perfect weather, I may add) and loved it even though she is not a museum kind of gal. If you say pesto and crunchy carby goodness, I say YUS PLEASE! These little bites are GORG, and I want to shovel 10 into my face right now. Have fun in LA! Pinned! 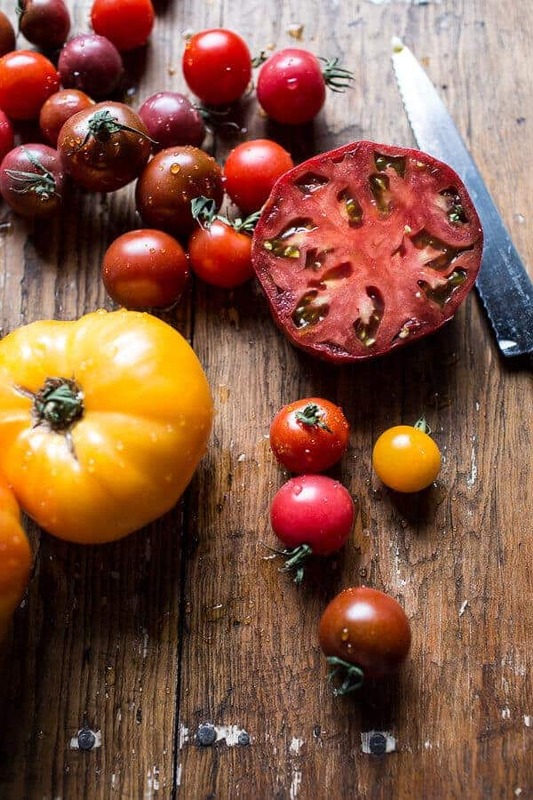 Those tomatoes! Where can I find those??? This looks so good Tieghan, perfect app for my daughters college grad party! Thanks! This looks amazing! Love how delicious those tomatoes look! And that chunky pesto looks divine! I am constantly in awe of your talent in making food look BEAUTIFUL. 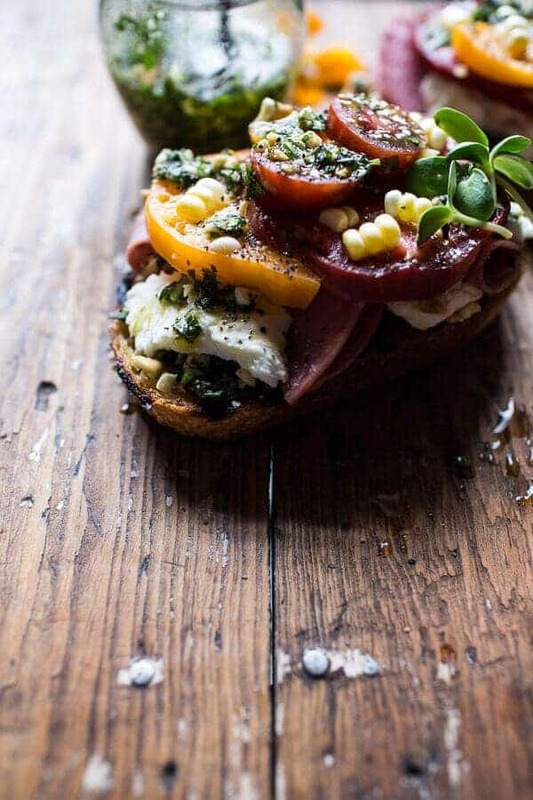 These bruschettas are everything. Have fun in LA and I know the sunshine and warmth is coming your way!!! Bread is a weakness of mine! 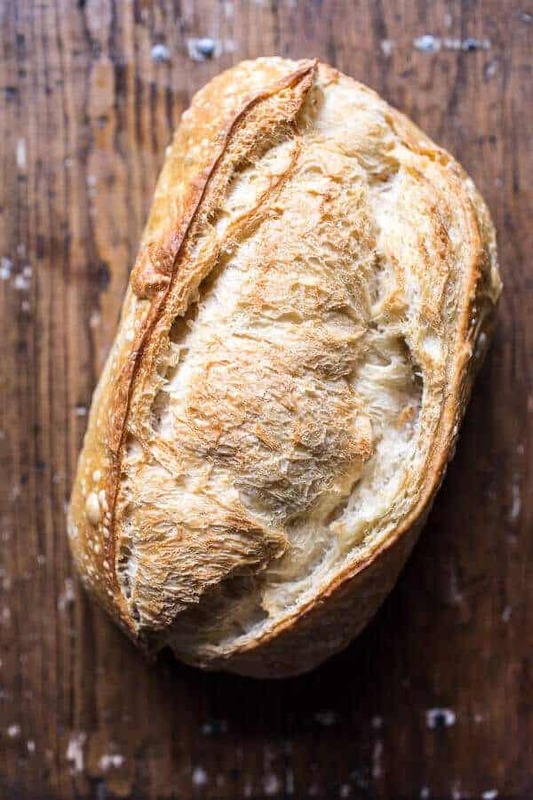 Is there such thing as whole-grain or sprouted sourdough? Please let me know! This looks like heaven! There is nothing as good as fresh bread and homemade pesto. This sounds amazing, and the styling is fabulous! This looks divine. 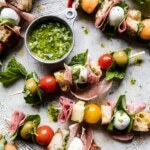 Bruschetta is my appetizer weakness — top that with arugula pesto means I absolutely will be making it sometime this week! PS – your photography is amazing! Would love to hear more about your time in LA! I started following half baked harvest about a year ago, but I never realized you had been planning on attending FIDM at one point! What were you planning on studying? This looks so delicious! I could definitely make this my lunch! omg Tieghen this is like my dream meal!! Looks so gorgeous! The pictures look so tasty. 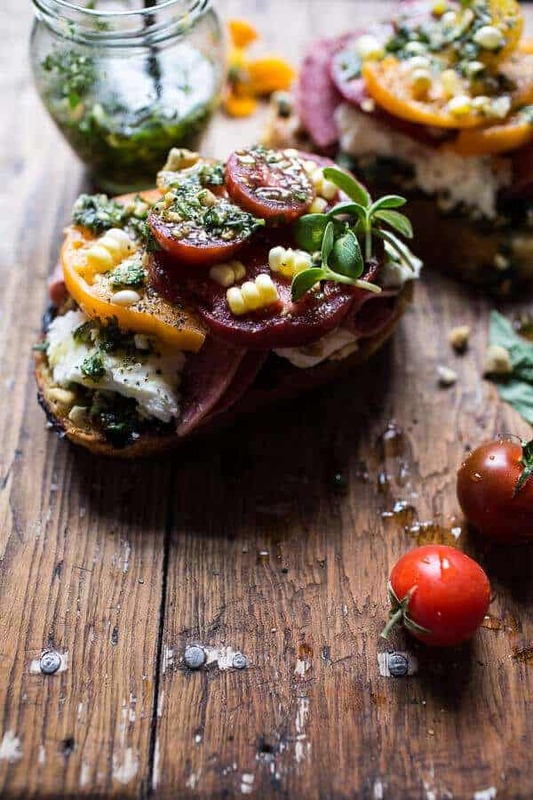 Bruschetta is my favorite thing ever, I’d inhale this! Gorgeous! I’m just so happy to have tomatoes again. I never grow tired of them. 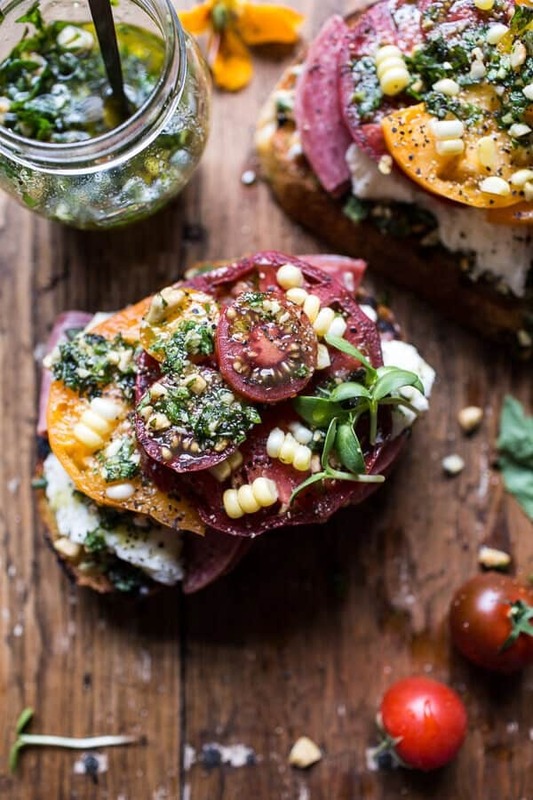 This bruschetta is just stunning. The colors. The textures. The whole thing. Wow!! 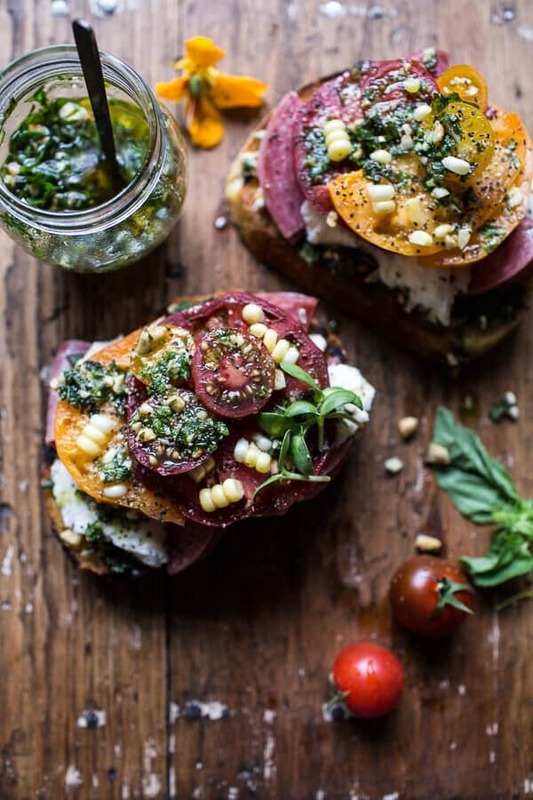 I can’t get enough of how colorful and mouthwatering this buschetta looks. Thanks for sharing! Lovely recipe! 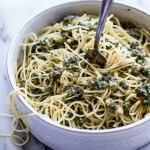 I adore pesto, all of them! Thank you so much for this post! i would have that for lunch.